Above: The Dexmo Exoskeleton glove can help you feel objects in virtual reality. A company called Dexta Robotics recently unveiled a new product that could end up revolutionizing the way VR hand-tracking and interaction takes place. Its called the Dexmo, and it is a futuristic looking exo-skeleton that attaches over your hand like a glove. The glove is full of components that are able to communicate with a VR experience and help you actually feel virtual objects held in your actual hands. 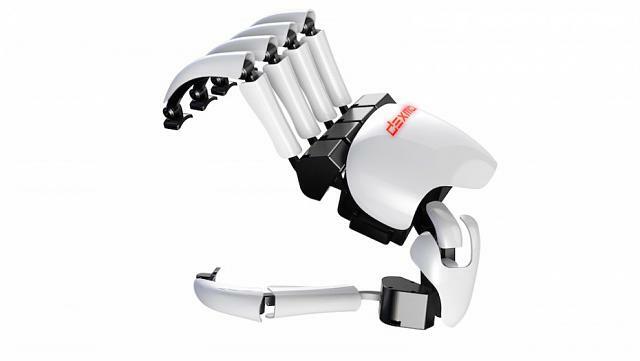 According to Dexta itself, Dexmo is a mechanical exoskeleton for your hands. It captures the full range of your hand motion and provides instant force feedback. With Dexmo, you can feel the size, shape, and stiffness of virtual objects. You can touch the digital world. Several options either on the market or coming to it soon aim to tackle hand interactions in VR. The popular HTC Vive headset, for example, ships with a pair of controllers that enable the tracking system to see your hands and use them to engage with items in a given experience. Later this year, Oculus will begin shipping its own, similar hand control option known as Oculus Touch, and in October, Sony will begin selling the PS VR which comes with two PlayStation Move Controllers for hand control. Leap Motion goes a step further, using a sensor to track finger and hand movements. All of these options work well for users, but Dexmo is offering something unique by adding haptic feedback to its take on hand tracking. This system may sound like the stuff of science fiction, but the idea, according to Dexta, is that the hand attachment physically pulls back your fingers to fit the shape of the virtual objects and it dynamically changes the force applied to simulate their stiffness. According to the company, Dexmo can simulate the clicky sensation of a button or trigger. It can simulate the shape of a knob and allow you to grasp and turn. While it is innovative, Dexmo is not a new product. It began with a Kickstarter back in 2014 that raised over $55,000, but ultimately, the project was canceled, with the Chinese robotics company saying it planned to reboot it at a better time. It seems that 2016 a world where VR is finally big business is that better time. No release or pricing information is available for Dexmo at this time. This would truly be cool. I'd imagine it would still feel weird, however, to have your hand act like it's touching something real and yet feel nothing of the texture of the object. Be like having complete numbness. If they manage to make the feedback in different ways it won't be a problem at all, like receiving different notifications from different thing on your smartphone, you know when it is an email and when it's a text just because the way it vibrates, doing something similar we may learn to differentiate one thing from another. oh my this is very promising. This has more functions than the Thalmic Lab Myo. I think this thing is going to take off. I hope they restart the development again. I think right now the cheapest to produce and integrate will be the standard and for a lot of time. I was looking one which was no more than simply a glove but it has some sensors so it tracs each finger with higher precision and the feedback was made in the wrist, looks great too, but I can't find the link.